Ever since Glossier came out with their makeup, I’ve been desperate to get my hands on the products. 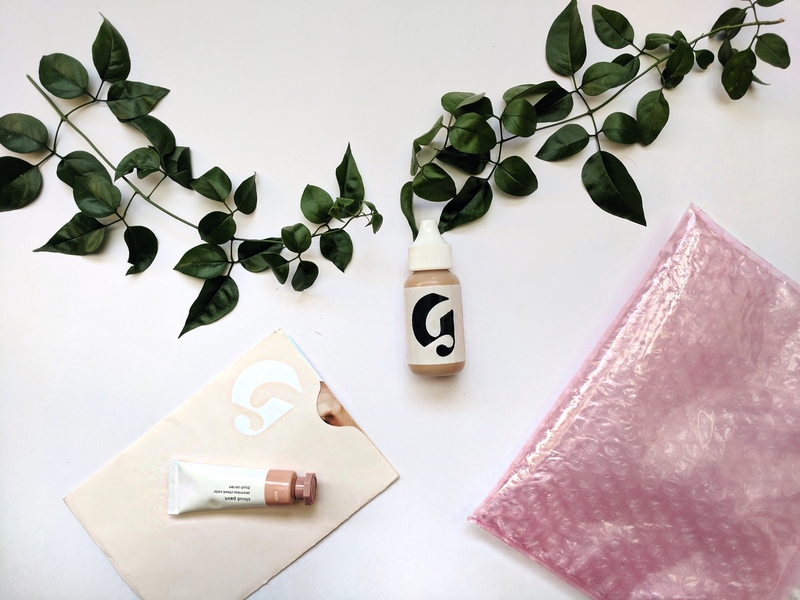 I don’t know if it’s my obsession with Into the Gloss, the cool girl, effortless chic ethos the adverts exude, or their skin first mantra, but I couldn’t wait to try out their products. Since I started my new skincare regime, my skin has been treating me far better than normal, and I’m starting to prefer easy fuss free makeup. Gone is the girl that would spend an hour contouring, shading, powdering. It’s a 5 minute deal now at most. But spot concealing without a base always LOOKS like makeup. The concealer never really seems to blend into skin seamlessly without at least a light base on. Up close it just ends up looking like splotches of makeup dotted haphazardly across my face. NOT a good look.So when I saw the skin tint, I had to grab it (along with Cloud Paint in dusk, reviewed here) It seemed like the perfect sheer base to even out my skin tone and layer under concealer. Read on to see if it passed the test! The bottle is very aesthetically pleasing: minimalistic but cool girl at the same time. I could definitely see this in a French pharmacy. The cap screws on tightly so it doesn’t leak in your makeup bag, and its small size makes it uber portable for on the go touchups. My only gripe is that once you’ve used a bit of the bottle, you have to use some force to squeeze out the product, despite its liquidiness. Another great thing about the packaging is that there aren’t any paper labels so the bottle doesn’t get stained with makeup marks and look dirty! They have 5 shades: Light, Medium, Dark, Deep, and Rich. Honestly, I think the names are a bit misleading since “dark” is what other brands would probably call a medium tan. Anyhoo, I was definitely skeptical about the limited shade range when I first picked it up, but I will say that the product stays true to the claim that it “adapts” to your skin tone. The product is so sheer that enough skin shows through for the slight shade difference not to matter. Having said this, I have seen complaints that shade tones can be too yellow/pink, something I definitely can see affecting how “adaptable” the shades are. This has as much coverage as they claim (or warn) it will. After all of the negative reviews saying it’s tantamount to nothing, I was pleasantly surprised. It’s like a subtle tint over your face that blurs uneven skin tone, and subtly lightens marks on your face. Nothing less, nothing more. If you’re the kind of person that hates concealer and likes a flawless face, or loves “the glam look” this isn’t for you. It’s a great option for people who want to throw something on when they otherwise wouldn’t have, not an alternative for heavier skin tints like the It Cosmetics CC cream. This tint grabs onto dry skin and uneven surfaces, so it’s important you start with a well-exfoliated face.I had to physically exfoliate with a scrub in addition to my normal chemical exfoliants (AHAS and BHAS) to make sure I had a smooth surface. This is definitely contrary to their claims that it’s a slap on kind of tint. It’s only a slap on kind of tint if you have perfect skin/take really good care of your skin. I followed up with a moisturizer with hyaluronic acid and let that absorb into my skin for five minutes before applying the tint. This made all the difference in giving me the smoothest finish possible. Guys, I know it’s marketed as “hydrating” but other than the dewy finish, it doesn’t do much for the skin underneath. The reason being, glycerin sits on your skin and pulls water in or out depending on the climate. If the climate is dry, the glycerin is going to pull the water right out of your skin and dehydrate it. You’ll be the worst combination of oily with dry skin, so make sure you moisturize well before using the tint. The tint is pretty unique in texture, so it takes some trial and error to get the perfect method down. After some experimenting, I found the sweet spot to be two sheer layers with just enough tint to cover the face each time and 30 seconds of dry time in between. Adding too much at once just makes the tint streak and take forever to settle in. I apply by squeezing straight onto my face. Don’t put it on the back of your hand or in your palms because a lot of the product just absorbs into your skin. Then I’ll smooth the tint out with my fingers to create an even layer. If there are any streaky areas, I just pick up my stippling brush and push the tint into my skin. This usually solves the issue. I wouldn’t recommend buffing because it tends to lift up dry skin that the tint will cling to. Overall, it’s easy enough application if you prep well, but I wouldn’t say it’s foolproof. The tint is absolutely gorgeous when used in conjugation with a heavier concealer (for those of us who have spottier skin). However, I did notice, that not all concealers play well with this foundation. I found that waterier concealers (like my Tarte Rainforest of the Sea concealer) that dried down to a matte or semi matte finish, weirdly crusted over the tint. The same went for the UD foundation I tried to spot conceal with. It looked great from afar, but up close it was a mess. I salvaged the look by attacking the crusty spots with a beauty blender, but it was a ridiculous amount of effort. What it did play well with were creamier concealers, even if they set to demi matte finishes. I don’t understand why this is, but it worked well with my Kryolan dermoflauge concealers, which are creams that set to a demi matte finish. So, I’d recommend pairing this tint with the glossier stretch concealer (I avoided this because coconut oil breaks me out) or any other creamy concealer of your choice. This was a fail from the get go. This tint is so sheer, by adding a colorless pigment aka primer, you’re basically sheering this out to nothing. Mixing foundation and primer is still a great way for me to be able to slap on higher coverage foundation while sheering it out and priming simultaneously, but I won’t be using this technique with my skin tint anymore. I used my holy grain full coverage foundation, the Urban Decay All Nighter, for this test. This was definitely my favorite of all the blends I tried out. I generally have an issue with the UD taking some time to melt into my skin (it looks a bit porcelain-like for the first 15 to 20 minutes). With the skin tint mixed in, I didn’t have to wait for that beautiful natural finish. The coverage was a step down from my Urban Decay, (on par with my Dior Forever) but the finish was so much more natural and flawless than my Dior. Another gripe I usually have with the UD is that I have to prime my nose because it tends to sink into my nose pores and accentuate them. With the skin tint mixed in, it lay beautifully on my nose, with no sinking. The mix wore well throughout the night (I have had issues with the UD foundation separating when used in conjunction with certain primers and mixed with other foundations). I don’t even think I was noticeably oilier by the end of the night! Success #3 for sure, this is going to be my go to night out base! On its own this bad boy lasts on my skin for 4-5 hours. Not bad for someone who gets only slightly longer wear time from supposedly oily girl friendly foundations (ehem Tarte Amazonian Clay Bb tinted moisturizer). With a primer, and a mid day powder touch up I get a good 3 hours tacked on to the initial wear time. One of the best things about this tint is that it’s so sheer, it fades imperceptibly, uniformly, and gracefully. You can’t really point out specific patches where the makeup has rubbed off unlike heavier foundations. I didn’t feel like I got uncomfortably oily till the fag end of the day. In fact, I wouldn’t call this an oily base at all. It’s more of a demi matte finish, and I can see people with drier skin needing to seriously moisturize before wearing this. The subtle glow is counter-intuitively, great for oily skinned people since most of us have acne scars and textural issues as well. The glow blurs these out without the need to bring out the war paint. I don’t mind if my scars peek through because the overall effect, especially at a average interpersonal distance is healthy, beautiful, even skin. Those with normal to mildly oily skin, no questions asked. If you have oily skin you can definitely make this work with a hard working primer and some powder, and for those with mildly dry skin, a good bit of exfoliation and moisturizer should make this workable. The only people I would not recommend this to are those with SUPER DRY SKIN. I emphasize this because I think there’s a huge misconception about dewiness being the same as moisturizing. It’s not. As a person with oily skin, I felt the need to moisturize beforehand, not only for smooth application, but because my skin felt dry and tight with just this on. You get 1floz/30ml in a bottle for 26 dollars. This doesn’t seem horrible considering my Dior Forever foundation is twice as expensive with the same amount of product (that glass bottle packaging really is deceiving). Considering how little you should (and can) use each application, this bottle should last you quite a while. And for this reason, I think that it’s definitely worth the price listed. This tint did exactly what I wanted it to do and more. It gave me a quick and easy way to slap on some makeup for errands, or for the one off coffee/dinner date. It’s hard enough to drag myself out of pajamas and away from my books, and makeup just feels like too much of a luxury to spend time on. 1. Oily all over, with one or two small isolated dry, rough spots thanks to tretinoin. 2. Acne prone: just pustules thankfully not cystic. Initially concentrated on one half of my face they spread to the other last year. I’ve been keeping them at bay with a strict skincare regimen (saving this for a later post). 3. Acne scarring and discoloration: When I scar, the scars are DARK. Thankfully, my skin tends to recover from scarring fairly quickly *knock on wood*, but the scars never fully fade. In addition I have an uneven skin tone, bettered by good skincare, but nowhere near porcelain. 4. Pores: I have fairly large pores that stretch from my nose area well into my cheeks. I use the benefit porefessional primer on occasion, but the silicone heavy formula breaks me out, so it’s only used when absolutely necessary. 5. Peach Fuzz: I have a good smattering of peach fuzz pretty much all over my face. I’m planning on getting it lasered off eventually. Anyone who has had this done before, I’d love to hear your experiences/advice before taking the plunge. 1. Longevity: Finding a light/semi sheer base for no-makeup makeup that doesn’t slide off or make you oily is a struggle for me. Tints and sheers are just not made for women with oily skin.